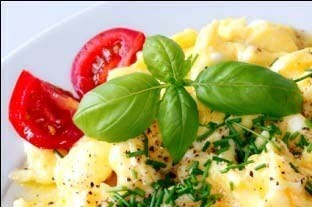 Melt butter and cream in a hot saucepan quickly, then add eggs, shallots, parsley, parmesan cheese, salt and stir well. Turn heat to very low – cover and cook for approximately 2 minutes. Stir and check consistency. If too thick add a little more cream. Remove from heat whilst still moist. Do not allow to dry out. The secret to fabulous scrambled eggs is not to overcook. Placing the lid on the saucepan will help retain moisture. Serve with a sprinkle of parsley, a quartered cherry tomato and fresh ground pepper to taste.